Influencer marketing is a tactic within public relations that uses a personality endorsement to sell products. This unique form of marketing, allows anyone with a decent followingand engagement pattern to be considered an influencer. It became popular in 2010 with the rise of social networking sites such as Facebook and the first company to use Facebook to connect with buyers was Amazon. 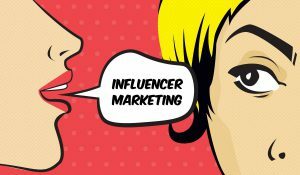 Since then, other companies have adopted influencer marketing into their communications plans as a tactic for outreach and tracking. Here are five reasons influencer marketing should be a part of all communications plans. 94% of marketers use influencer marketing to reach their target audience easily and quickly. Consumers engage influencers with whom they share interests with. This allows companies to be more effective than traditional marketing. e of the advantages of working with influencers is they can create quality content their audiences are interested and invested in. The influencers also know the best way to educate audiences about products because of their personal interest. According to studies, influencers have power on whether people buy a product or not. Influencers give consumers an “honest” opinion on why or why not a product works. Their reputations are built on maintaining and building relationships with their audiences. Influencers are present during every stage during the customer-buyer journey, which allows the brands to remain present and top-of-mind. It improves reputation both online and offline. People traditionally believe if someone popular endorses a product or service then it must be a good product. It is important to use this as a strategy to position, creditability, identity and image. It builds customer trust and brand loyalty. Putting your brand in front of thousands of customers who actually have a vested interest in the product is great for success. As more people interact with the message, the higher chance they will become customers and later on brand advocates. The social tipping point shows, it takes 25% of people to make a change before a large-scale change happens. Influential voices give easy access to target audiences. Utilizing influence can be a huge help in developing a communications strategy.